I know that we are always hearing about its importance but I'm really not much of a breakfast eater, mainly just opting for a piece of fruit or two on weekday mornings. This may well be down to my tendency to eat a bit too much at night but what can I say, I love a good evening-time munch. At the weekends though I do like to have a little play with breakfasty things, even if I often eat them at lunch or dinner time instead of first thing. I had made these intriguingly titled Carrot Cake Pancakes a couple of times recently and liked them a lot. They made me think that similar ingredients could work well in porridge form. I am really a pretty new porridge eater. I think people react to oats differently and they never made me feel great when I just ate a big plain bowl of them in the past. I used to get that carby bloated feeling. In fact, even though I know it's long been renowned for its high satiety factor, I always imagined that eating porridge actually made me hungrier and even gave me cravings later in the day. 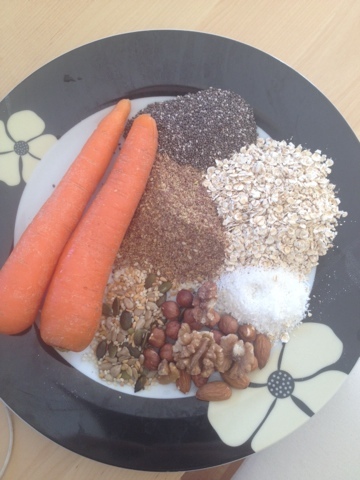 Here, a smaller volume of actual oats and the addition of lots of nutritious extras like mixed nuts and flax and chia seeds ups the protein content and makes for an entirely more satisfying eating experience. Apart from the odd packet of dry roasted in the pub, nuts and seeds are things I almost never ate in the past. Now, I have some almost every day, my favourites being pecans and hazelnuts (Lidl have amazing quality nuts at great prices). Another revelation for me was discovering that pretty much any selection of nuts and seeds make the most amazing snack when roasted with just a little bit of olive oil and soy sauce and sprinkled with chilli flakes - all the saltiness and munchability of crisps but with a welcome dose of goodness. Just don't make more than you plan on eating. You will not be able to stop. 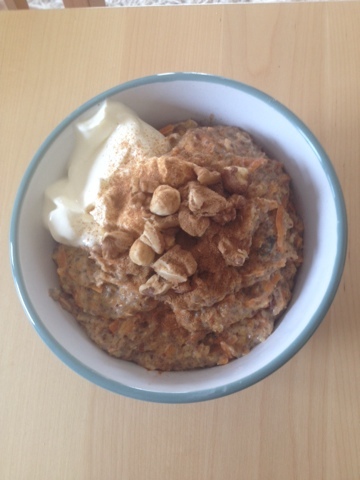 But back to this porridge which sounds a bit mad but, believe it or not, really does taste a lot like carrot cake! I didn't add them but some raisins or sultanas would work very well here too. I don't eat much dried fruit these days as I find that even a handful has a similar effect on my blood sugar to eating a Mars bar. I'm all for a bit of sweetness though and I had intended to add some maple syrup of honey here but found that it (bizarrely) didn't need it. The only sweetness is from the carrots and desiccated coconut. However, I've found that the pinch of salt is an essential addition, making the natural sweetness much more pronounced. I'm trying to replace some of the dairy in my diet with non dairy alternatives at the moment so I have used almond milk in this recipe. The dessert factor of this is upped with the addition of a dollop of (full fat) Greek yogurt and a few more toasted nuts sprinkled on top. My flattie even had it last week with ice-cream! Either way, this creamy, spiced, nutty porridge really is magically indulgent and virtuous all at once. What's not to like?! To be fair the directions here are pretty basic. Roast the nuts and seeds in a preheated oven for about 10 minutes. Mix everything else together in a saucepan and cook on a low to medium heat for about 5 - 7 minutes until thickened and the carrots are softened.